Choose Acrylic Designer Series Options & Add To Cart! SALE! 7x7, 12x8, 12x9, 12x12 and 15x10 sizes are 30% off through April 25th! Use code smallacrylic30 at checkout. 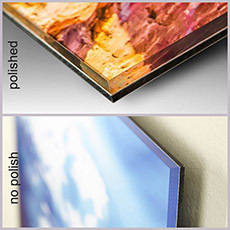 Your photo is printed to satin or metallic paper and then face mounted to 1/8" acrylic. We then back it with either 3/8" thick white or black acrylic for a beautifully accented look. A full aluminum subframe and cleat hang system provides an elegant floating & hanging option. Standard Anti-Glare: 50% glare reduction. TruLife: 25% anti-glare, anti-scratch, anti-dust. Diamond polished edge on both face and back acrylic.